We have been away at the bach this weekend. We arrived on Thursday night last week and as we were settling in and unpacking I picked up MJ's iPad. I looked at his photos as they are always really candid ones of me and the kiddies. I browsed through and saw a video I have never seen before. It was a video of me and my Mom talking, taken without my knowledge. I was relating a dream I had had of the little piece of land we all dreamed of. My mom would have a cottage near us and be in charge of all the flower gardens. I said to my Mom " I so hope this dream comes true." My Mom smiled at me and said "Me too". I walked outside into the clear starry night and stood at the waters edge. Waves of grief washed over me like they haven't since the day of her funeral. I railed at the cold dark heavens. Why? Why? In the last 6 years we have buried my mother, my father and my father-in-law. We have begged for each one's life. And each was desperate to live. There was no answer to my question. Only the icy cold unfeeling stars winking down at me. Two nights later I sat at that same beach. Tucked in my chair at the fires edge I held little Grace on my lap. She snuggled under the blanket I had made and laid her head on my chest. As she fell asleep I felt such gratitude rise up in me where grief had risen up two days before. I have been going to our bach since I was first married. I have walked that beach desperate for a child. We fled to the bach each time we miscarried or our fertility treatment failed. It is our sanctuary. 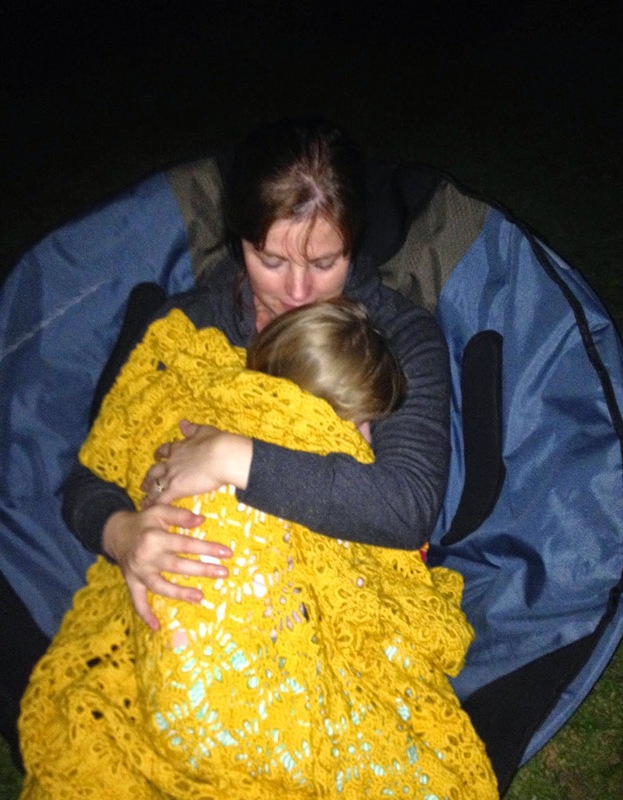 I held my daughter in my arms beside a warm fire tucked under a blanket I had made. I looked up to the stars. This night they were warm and twinkling. They enveloped me and my sweet girl and I felt truly thankful. The same stars under the same sky on two different nights. I still have no answers. But I think if I sit here long enough, it may just be ok.